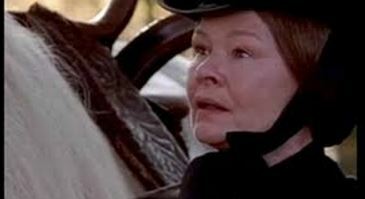 Dame Judi Dench to Play Queen Victoria ~ AGAIN! This is very exciting news! Academy Award Winner Dame Judi Dench is set to play Britain’s Queen Victoria in a new film produced by Focus Features, directed by Oscar Nominee Stephen Frears. It’s called “Victoria and Abdul.”This is the news from Kristin Carag, the publicist of the film, who just sent me this exciting press release. I thought I’d print all of it for you. 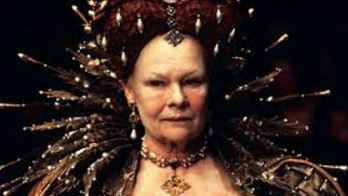 Judi won an Oscar for playing Queen Elizabeth 1(pictured above) in “Shakespeare in Love.” And the last time she played Queen Victoria in “Mrs. Brown”, she got Oscar nominated, but didn’t win. I think in all she’s received something like six nominations as detailed below. LONDON, June 17th, 2016 – Academy Award winner Judi Dench will star as Queen Victoria and Academy Award nominee Stephen Frears (The Queen) will direct Working Title Films’ Victoria and Abdul, to which Focus Features will hold worldwide rights as part of the company’s renewed global initiative. The movie is slated to go into production this year for a 2017 release. Focus will release the movie domestically and Universal Pictures International will distribute the film around the world. Victoria and Abdul is being co-financed by Focus in association with BBC Films. The screenplay of Victoria and Abdul is by Lee Hall, an Academy Award nominee and Tony Award winner for Working Title’s Billy Elliot; and is based on Shrabani Basu’s book Victoria & Abdul: The True Story of the Queen’s Closest Confidant. Victoria and Abdul was developed by Beeban Kidron and Lee Hall at Cross Street Films with BBC Films, and is being produced by Ms. Kidron, Academy Award nominee Tracey Seaward (The Queen), and Working Title’s co-chairs Tim Bevan and Eric Fellner. Mr. Bevan and Mr. Fellner have produced several Working Title movies for Focus release, including the Best Picture Oscar nominees Atonement and The Theory of Everything. The film tells the extraordinary true story of an unexpected friendship in the later years of Queen Victoria’s remarkable rule. When Abdul Karim, a young clerk, travels from India to participate in the Queen’s Golden Jubilee, he is surprised to find favor with the Queen herself. As the Queen questions the constrictions of her long-held position, the two forge an unlikely and devoted alliance with a loyalty to one another that her household and inner circle all attempt to destroy. As the friendship deepens, the Queen begins to see a changing world through new eyes and joyfully reclaims her humanity. Ms. Dench will be playing Queen Victoria for a second time in Victoria and Abdul, having been Oscar-nominated for her previous portrayal in Mrs. Brown. She won her Academy Award for portraying Queen Elizabeth I in Shakespeare in Love; and later received Best Actress Oscar nominations for her performances in Mr. Frears’ Philomena, also a Best Picture Oscar nominee, and Mrs. Henderson Presents. Victoria and Abdul reunites Working Title with Ms. Kidron, Mr. Frears, and Mr. Hall. Working Title has made five previous projects with Mr. Frears; and has made multiple films with Ms. Kidron and Mr. Hall, including Bridget Jones: The Edge of Reason and the global hit Billy Elliot, respectively. Tim Bevan and Eric Fellner have been co-chairs of Working Title Films, one of the world’s leading film production companies, since 1992. Working Title has made more than 100 films that have grossed over $6 billion worldwide. Its films have won 12 Academy Awards (for Tom Hooper’s Les Misérables and The Danish Girl; James Marsh’s The Theory of Everything; Tim Robbins’ Dead Man Walking; Joel and Ethan Coen’s Fargo; Shekhar Kapur’sElizabeth and Elizabeth: The Golden Age; and Joe Wright’s Atonement and Anna Karenina), 39 British Academy of Film and Television Arts (BAFTA) Awards, and prizes at the Cannes and Berlin International Film Festivals. Mr. Bevan and Mr. Fellner have been honored with the Producers Guild of America’s David O. Selznick Achievement Award in Theatrical Motion Pictures, the PGA’s highest honor for motion picture producers. They have been accorded two of the highest film awards given to British filmmakers: the Outstanding British Contribution to Cinema award at the BAFTA Awards, and the Alexander Walker Film Award at the Evening Standard British Film Awards. They have also both been honored with CBEs (Commanders of the Order of the British Empire). The company’s commercial and critical hits include The Interpreter, About a Boy, Notting Hill, Elizabeth, Fargo,Dead Man Walking, Bean, High Fidelity, Johnny English, Billy Elliot, Four Weddings and a Funeral, Bridget Jones’s Diary, Bridget Jones: The Edge of Reason, O Brother, Where Art Thou?, Love Actually, Shaun of the Dead, Pride & Prejudice, Nanny McPhee, United 93, Mr. Bean’s Holiday, Hot Fuzz, Elizabeth: The Golden Age, Burn After Reading,Frost/Nixon, Atonement, Senna, Tinker Tailor Soldier Spy, Anna Karenina, Les Misérables, I Give It A Year, About Time, Rush, The Two Faces of January, Trash, The Theory of Everything, Legend, Everest, The Programme, The Danish Girl, Grimsby, and Hail, Caesar! Working Title’s upcoming slate includes Bridget Jones’s Baby, directed by Sharon Maguire and starring Renée Zellwegger, Colin Firth, and Patrick Dempsey; The Snowman, directed by Tomas Alfredson and starring Michael Fassbender, Rebecca Ferguson, and Val Kilmer; and Baby Driver, directed by Edgar Wright and starring Lily James, Ansel Elgort, Kevin Spacey, and Jamie Foxx. Coldest City, directed by David Leitch and starring Charlize Theron and James McAvoy; J.A. Bayona’s visually spectacular drama A Monster Calls, starring Sigourney Weaver, Felicity Jones, Lewis MacDougall, and Liam Neeson; and Jeff Nichols’ Loving, based on the love story of Richard and Mildred Loving, portrayed by Joel Edgerton and Ruth Negga, which world-premiered at the 2016 Cannes International Film Festival. Focus Features and Universal Pictures International are part of NBCUniversal, one of the world’s leading media and entertainment companies in the development, production, and marketing of entertainment, news, and information to a global audience. NBCUniversal owns and operates a valuable portfolio of news and entertainment television networks, a premier motion picture company, significant television production operations, a leading television stations group, and world-renowned theme parks. NBCUniversal is a subsidiary of Comcast Corporation.